ENERGY PROCESSING CANADA is Canada's only downstream oil and gas publication for more than 40 years (adding the midstream sector along the way), ENERGY PROCESSING CANADA endeavours to present changing technologies in the hydrocarbon processing industry and to promote the well-being of this sector of the petroleum marketplace. 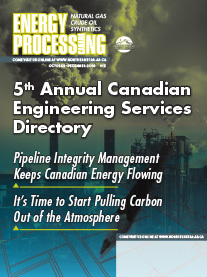 With timely articles, both technical and company specific, ENERGY PROCESSING CANADA has covered the ever-changing downstream sector, chronicling the movers and shakers and defining events. It is no secret that for years the Canadian pipeline industry has been facing significant regulatory and approval issues related to progressing new pipeline projects focused on transporting Alberta oil to new markets and expanding the transportation capabilities to existing customers. Numerous pipeline owners have faced significant delays on various projects which have dominated national headlines.